Provide students and staff with a safe and structured space to share and celebrate their likes, dislikes, goals, dreams, and many other things that come together to make their unique identities. Provide students and staff with opportunities to build relationships with each other that may not arise in the course of a typical school day. The community circles meet consistently to provide a foundational space of trust among students and teachers. In times of crisis or tragedy, we can lean on these circles as a constructive place to process and heal. We actively work to make sure that our approach to discipline does not replicate the serious flaws in our country’s criminal justice system. For over two decades, KIPP Academy relied on behavior management system that relied too heavily on punishment and attempts at deterrence. At the start of the 2017-18 school year, we followed the footsteps of many other schools in and out of KIPP began instead embracing a commitment to restorative justice. Students who make hurtful choices still receive consequences, but those consequences are designed with the main goals of helping to genuinely fix problems, learn life-long lessons, and maintain the dignity of the student. During the summer before their 8th grade year, a group of 15 students spend two weeks learning how to facilitate community and restorative circles. When the school year begins, these students officially become Peer Leaders. During the first week, they model important character and academic behaviors (in the picture above, they are modeling a socratic seminar). 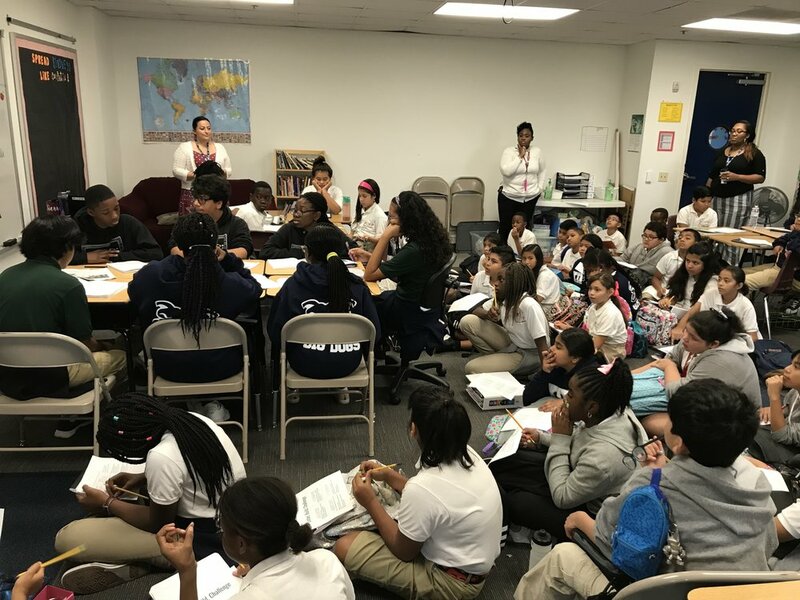 Throughout the year, they run community circles with all 5th graders and restorative and problem-solving circles with fifth graders who are experiencing conflict or having difficulty making positive choices during school. In the past, all of this would have been done by teachers. We are extremely proud to be giving our students a chance to prove that they are just mature and capable of helping their younger teammates.